Therefore, post-election the only "real estate" we're really thinking about is the White House. A little background on Washington, DC's most famous piece of real estate: The house was designed by Irish-born James Hoban and has been the residence of every U.S. president since John Adams. Construction began in 1792 and was completed in 1800. The White House has undergone many transformations throughout the years. When Thomas Jefferson moved into the White House in 1801, he (with architect Benjamin Henry Latrobe) expanded the building outward, creating two colonnades that were meant to conceal stables and storage. Perhaps most notedly, during the War of 1812, the British Army set the White House ablaze in the Burning of Washington. The mansion was immediately re-constructed, and three years later President James Montroe moved into the house. 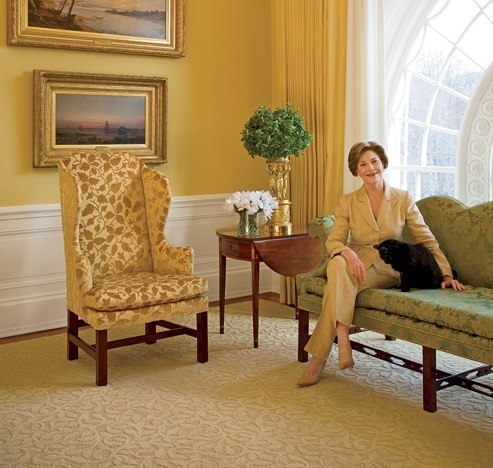 The White House has had quite a few of Type A "renters" throughout the years and, as could be expected, the White House has been renovated by many Presidents and First Ladies. Some changes were significant - moving the offices and expansion, for example. Others involved decor changes to suit the inhabitants' tastes and needs. We had such a great time looking through White House photos throughout the years. We pulled twenty or so of our favorites ... you're in for a treat. Photos courtesy of various news sources and Architectural Digest. Newer PostThe Urban Electric Co.